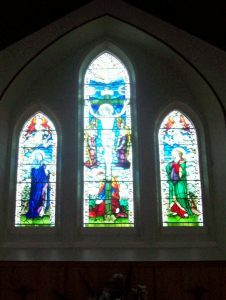 Bill and I first saw the beautiful stained glass windows in St Mary’s Star of the Sea RC Church in Castlebay, Isle of Barra 2 years ago when we were on holiday in the islands. Also on the same tour was a widow from Glasgow, Ena Hutchison, whose husband had died suddenly soon after designing and installing the windows. Ena had never been to Barra and so her visit to the church was very poignant and I was happy to send her a copy of this photograph. 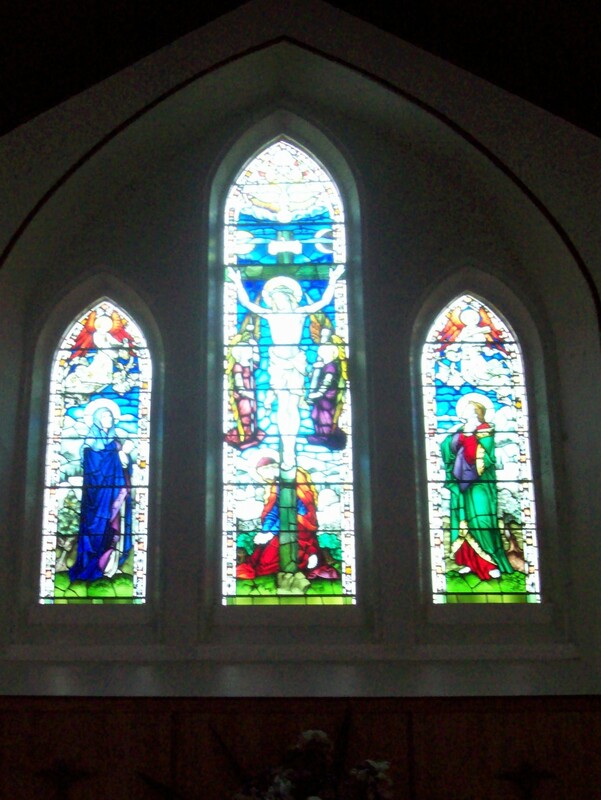 The windows featured on the BBC documentary, Island Parish which featured the parish Priest Fr John Paul McKinnon back in 1999 and, sadly, more recently when Fr John Paul was interviewed after the death of a Barra girl, Eilidh Macleod in. the Manchester Pop Concert bombing. Bill and I spent a few days in Barra in August and attended a Mass to celebrate the Feast of the Assumption of the Virgin Mary. Sadly, Fr John Paul was on the mainland attending the funeral of a Falkirk man who had died, along with his Barra friend, while diving for scallops in Castle Bay so, although we have corresponded by e-mail we have still not met Fr John Paul. We were, however, made welcome by his friend and locum priest Fr Stewart and, although we were not allowed to take communion, we were given a blessing and we lit candles for our late daughter Hazel and prayed for Eilidh’s family in the Lady Chapel. We also remembered Eilidh’s friend Vicky who was injured in the bombing and who was still in hospital. Such a beautiful, peaceful place to be saddened and scarred by these tragedies.